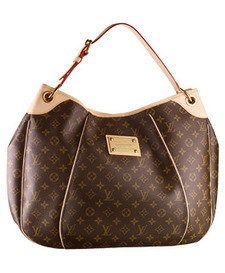 "I adore my new LV; it's the Galleria GM and I am so infatuated with it. It's big and slouchy and beautiful, with the perfect rounded shape. I was going in to Neiman's to buy the Louis Vuitton Palermo GM when I saw them showing the Galleria GM to another customer; they said it just came in that day. I was in Beverly Hills a few days before and they didn't even have it in the Rodeo Drive store then! I can fit my old purse inside it (I don't really wear my old bag inside it but I could, it's sooo roomy) and still have room for all the kids' stuff and my makeup bag. Right this second I have in there a sippy cup, a small diaper bag, my sunglasses, phone, keys, a tennis ball, tissues, a toy camera, my large wallet, my daughter's sunglasses (she's so fffabulous too), and a 40-page draft of a magazine I'm editing! Only drawback is that the cell phone slot is too tight for my iPhone when it has its protective rubbery case on, but that's pretty much a universal flaw for LV bags. Also, the super soft interior is ivory so it’s sure to look dingy soon. Okay, I have to stop obsessing over my handbag and put my child to sleep now..."